The Manchester YMCA Harriers were established in 1882. We are one of the oldest running clubs in the UK, if not the world! Our group runs take place every Thursday evening, starting from the Y Club at 6:30pm. We start the session with some dynamic stretching (a.k.a. “”The Ministry of Silly Walks””), after which we head out for the run. We run a variety of routes and distances to keep things interesting, but we’re normally back at the Y Club before 8:00pm. 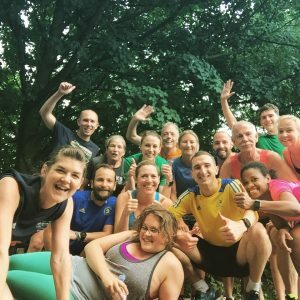 Our group runs are social affairs – nobody will get left behind! We split up into different pace groups and offer a short, medium and longer distance. The Thursday night run is a great introduction to the club; if you’re interested in joining us, come along to one of our group runs and give us a whirl! To see what routes we are running in the next few weeks, take a look at our upcoming events on our website. We also hold speedwork sessions every Tuesday evening at the Manchester Regional Athletics Arena, as well as marathon training sessions on Sunday mornings in the build up to the spring marathon season. We take part in various different races, in Manchester and around the world, and you are encouraged to take part in as much or as little as you like! We also have a monthly social night after the group run which usually involves beer, chips and lots of chat to get to know everyone.